Judi Diamond brings energy and entertainment to the airways each morning. Say hello to this radio deejay and find out how the bumpy road she took to Rockford makes her appreciate the good things about our region. Judi Diamond, host of B103’s morning show, has made Rockford her home. One of her hobbies is doing yoga on the rooftop at The Standard. 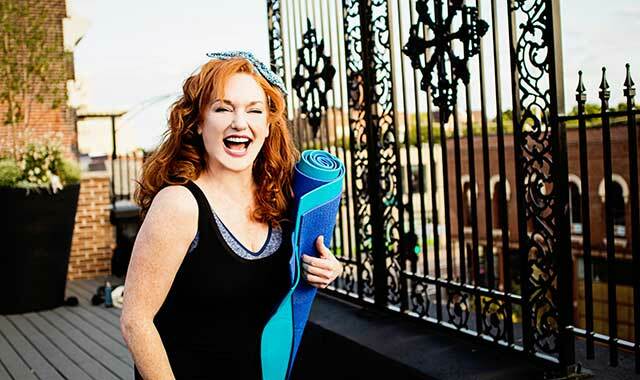 Judi Diamond walks into a downtown Rockford restaurant wearing a black workout top, matching yoga pants and a headband to keep her auburn red hair in place. She’s 90 minutes away from taking a yoga class that will be held on the rooftop of The Standard, a downtown building overlooking the Rock River. She only started yoga a couple of months ago, but now is hooked. “I do it every day,” she says. That’s how Diamond, the morning host of B103 for the past year, rolls. Whatever she gets involved with – from supporting a cause to taking up a new hobby – Diamond goes all out. As a St. Louis deejay, she once got a mammogram on the air to help raise awareness of breast cancer. Diamond comes from an entertainment family. Her grandparents moved from England to Los Angeles where they worked in the entertainment industry, handling public relations for some of the biggest stars, including Frank Sinatra and Dorothy Lamour. Diamond’s parents, David and Rita, still call L.A. home. Growing up, Diamond was a shy, but very curious girl with quite an imagination. When taking car trips with her family she’d make up stories about the people who lived in the homes they passed. Her favorite pastime remains sitting in airports just to people watch. “I love people. I find them extremely fascinating,” she says. At age 10, Diamond convinced her parents to let her take ballet classes as a start to pursing an acting career. As she got older, Diamond eventually found her way into commercial and voiceover work, including for McDonald’s, and she even wrote some for Comedy Central. A self-proclaimed horrible waitress, Diamond painted murals to help make ends meet. But the station was bought out, which left Diamond, now divorced, raising two young children, without a job. It was around that time that she met Kate Frisina-White, and the two came up with an idea to start a reality show about the everyday lives of mothers. Eventually, the show became “Mom Friends Forever” and was picked up by Viacom and aired on Nick Jr. The show followed Diamond and Frisina-White, who works at Trader Joe’s, and their busy lives. The show aired for 26 episodes over two years before the Nick Jr. channel was shut down. Out of work again, Diamond contemplated a move back to California. Her daughter, Shira, is there, attending law school, while her son, Leo, is in college in St. Louis studying to be a composer. Instead, Diamond got a call from a consultant with a job opportunity in an unlikely location – radio station 99.3 WAJK in sleepy LaSalle, Ill. “I always wanted to live in a small town,” she says. “I was there four months and had planned on staying.” That is, until Rockford and B103 came calling. While Diamond may have come to Rockford for a job, she says she has found a place to call home. She recently purchased a home in the River District and spends most of her free time exploring the city and meeting new people. She’s discovered City Market on Friday nights, the Peace Plaza (“I got the chills”), and the Boone County Historical Museum, not to mention the arts community and a number of authentic restaurants. She took part in a trivia night at a local church and, of course, there’s rooftop yoga on Thursday nights. It should come as no surprise that Diamond has a gift to gab. She’s in radio, after all. In a 75-minute conversation, she covers a range of topics from old-school rap to details of her bucket list. fans were waiting 108 years for this.” And she adores Rockford IceHogs hockey. “The fans are rowdy and fun. I’d like to party with them,” she says. Her bucket list includes riding a Zamboni with mascot Hammy Hog. “I’m fun-crazy,” she says, laughing. “So many people are self-centered. My goal is to be less self-centered and become more centered self. I deal in positivity. I want to bring people together. Maybe I can be a catalyst for change.” There’s little doubt she can. This entry was posted on Friday, August 17th, 2018 at 11:55 am	and is filed under Features. You can follow any responses to this entry through the RSS 2.0 feed. Both comments and pings are currently closed.